A brief history of the movement for workers' self-management in the 20th and 21st centuries. Examines instances of workers' control in Yugoslavia, Chile, Bolivia, Peru and contemporary Argentina. Historically, WSM has been the centerpiece of the socialist project, dating back to Karl Marx's famous statement that the "workers' emancipation can only be accomplished by the workers themselves". In that sense, WSM as the road to socialism stands in contrast to the bureaucratic centralism of the former Soviet Union and the hierarchical system of capitalist management. This essay will briefly survey the great potentialities of WSM and then review some historical experiences during the 20th century to point up some historic lessons that are relevant to the current Argentine experience. The Argentine experience with WSM exemplifies some of these potentialities. In Brukmann textile factory and Zanon ceramic factory as well as in the WSM enterprises established by the unemployed workers in Solano and elsewhere, productive and distributive decisions are taken by assembly of all the workers (see Interviews by Mario Hernandez 23-08-02 FSM (La Casona). The high degree of solidarity is evidenced in the popular slogan "an attack on one, is an attack on all ("Tocas uno, Tocas todos"). WSM was the official doctrine of Yugoslav socialist regime between 1950 and the breakup of the Yugoslav Federation. Throughout Yugoslavia all the major factories were under the system of WSM, resulting in greater influence over production and income than anywhere else in the former socialist countries. Free health and education and secure employment was guaranteed by WSM. The WSM movement in Yugoslavia emerged from the defeat of fascism, Yugoslavia's President Tito's break with Stalin and the Soviet Union and the socialist revolution. The WSM went through several phases, in the first period 1950-64 it operated at the factory level as the Communist Party controlled national policy; from 1965-1972 under "market reform", the WSM factories began to be effected by capitalist pressures, resulting in greater social inequalities between factories and economic sectors as well as unemployment; the period between 1973-1990 the encroachment of ethnic chauvinism, IMF pressures and the degeneration of the Yugoslavia Communist Party led to the eventual demise of WSM. In Chile, under the Allende government (1970-73) over 125 factories were under some system of WSM. About half mostly controlled by public functionaries, the other fifty percent by commissions of workers in the factories. Studies demonstrated that the factories under WSM were much more productive, efficient and with less absenteeism than state run factories under centralized management. The WSM movement created "cordones industriales" industrial belts which coordinated production and self-defense against capitalist attacks. In the successful factories controlled from below, the party and trade union disputes were subordinated to the power of the popular assemblies in which all workers in the factory participated. WSM defended the factories from closure, protected workers' employment and vastly improved social conditions or work. Most importantly it raised workers' political consciousness. Unfortunately, the WSM took place under a parliamentary socialist regime and a capitalist state. WSM created a situation of dual power between the workers' power embodied in the factories and the cordones and on the other hand the military-bourgeois state apparatus. The Allende Government tried to balance between the two power centers, refusing to arm or to repress the workers. The result was the military coup of 1973 which led to the overthrow of Allende, the destruction of the WSM movement. The lesson was clear: as the success of the WSM advanced and spread throughout the country, the displaced capitalist and landlord class turned toward violence and repression to recapture control over the means of production. The capitalists first attempted to sabotage distribution and production via truckers strikes,then they attempted to block financing and finally they turned to the military and dictatorship. The WSM attempted to pressure Allende to act more decisively in the face of the imminent threat but he was blindly committed to parliamentary procedures and the WSM was defeated. If the WSM in Chile as in Yugoslavia had moved from the factory or sectoral bases of organization to the taking of state power, the workers would have been in a superior position to defend the system of WSM. The system of worker self-management in Bolivia emerged from the popular revolution of 1952, when an alliance of class conscious miners, peasants and nationalist petty bourgeois overthrew the oligarchical pro-imperialist regime. In the first phase of the revolution, the workers and peasant militias were able to destroy the army, expropriate the mines and realize the redistribution of land. The armed militias of the miners, through their assemblies and unions however, were geographically and politically confined to their mountain strongholds and isolated from the mass of the peasantry, which came under the influence of the nationalist petit bourgeoisie (Nationalist Revolutionary Movement) which gained control of the government and reorganized a bourgeois state. This created a system of dual power which led to intensified conflict in the post-revolutionary period. Throughout the 1950s the Bolivian Workers' Movement took militant action, general strikes, armed confrontations, to defend the gains of the Revolution, while the MNR bureaucratized the nationalized mines, establishing a State Mining Company, COMIBAL which effectively took control away from the workers while retaining state ownership. In 1964, a military coup led temporarily to the military occupation of the mines. However, a worker-peasant alliance with the progressive military government of J.J. Torres in 1970 led to the re-emergence of popular power in the Popular National Assembly. While the Assembly approved of revolutionary legislation, it did not have state power. A military coup led by General Banzer dissolved the Assembly and effectively destroyed the miners' militias. In 1967 a group of progressive nationalist military officers led by General Velasco Alvarez took power. The new regime expropriated a large number of mines, factories and plantations and established two types of innovations: industrial cooperatives and industrial communities. Industrial cooperatives were based on management-workers participation and led to significant growth of productivity and socio-economic benefits, but eventually management took over the policymaking and marginalized or co-opted the worker representatives. The industrial communities were supposedly a form of co-participation between military officials, and workers, but de facto, the military officials retained the centralized control of the previous capitalist ownership as well as the salary differentials. As workers realized that co-operatives and industrial communities organized from above would not operate in their interests, they organized to democratize them and to secure greater control and equity, frequently resorting to strikes against their own enterprises. Eventually, under neo-liberal rulers, the factories and plantations were re-privatized and the progressive labor legislation under Velasco was abrogated. The lesson from Peru is that statification or nationalization from above reproduces the hierarchical structure of capitalism and marginalizes the role of the workers in the public sector. The social gains achieved by the workers in the struggle are then reduced by the bureaucrats in charge, who operate with capitalist criteria. Corruption and mismanagement by the bureaucrats and the lack of workers' control leads to de-nationalization and privatization. Several important lessons of past experiences with WSM are relevant to Argentina's growing number of worker-managed factories. 1) The success of past worker-managed factories was based on horizontal structures based on popular assemblies. The successful operations in Chile and Yugoslavia were based on workers' councils and factory assemblies. 4) The context for the growth of WSM movements varies from country to country and under specific conditions. In Yugoslavia, WSM began with the workers' anti-fascist war, and culminated in the massive occupation of factories under the Yugoslav Communist Party. In Chile, WSM was a result of both government policy and direct intervention of workers to prevent capitalist lockouts and sabotage. In Bolivia, WSM grew out of a popular anti-oligarchical insurrection. Only in Yugoslavia did WSM consolidate power over 3 decades, and that is largely because the state power was in the hands of a non-Stalinist Communist Party. WSM, in order to consolidate and operate needs to move from the local to the national, from the factory to the state, from the employed industrial workers to the unemployed, the youth, women, ethnic minorities. Argentina's growing WSM movement, particularly in the occupied factories and in the enterprises organized by the unemployed workers' movements the MTD have opened a wide-ranging debate on the structure, trajectory and politics of the movement. In the debate at the Foro Social Mundial on "Emprendimentos Productivos, Propuestas Obreras Desocupacion y el Cierra de Empresas" it became clear from the interventions of workers from Grissinoppoli and Bruckman, that the workers' takeover was the result of necessity not ideology: the workers had not been paid for several months and when paid their pay was reduced; the owner was emptying the factory and dismantling machinery, etc. In other words, the worker takeover was a desperate act to save their jobs. Once the factories were organized, then the more political workers in general assemblies proposed that the workers organize production and sales without the capitalists. Eventually, the move toward a WSM factory attracted economists and professionals who offered technical advise on how to operate the factory. In the course of these developments, as Ivana from Grissinoppoli stated, "we are learning every day…the struggle is long…but we are learning to jump over the obstacles because we listen and we understand each other". The struggle and the practice of self-management is creating the class consciousness as much after the factory occupations as before. The Argentine experience with WSM in the unemployed workers is also leading to new forms of social organization popular assemblies. As Valdemar (MTD-Solano) noted, the guiding organizational principles of the movement is direct democracy, horizontality, and autonomy. The distrust of representative democracy is based previous barrio and trade union experiences where leaders were bought off or corrupted. As our previous discussions of experiences with WSM in Peru and Bolivia suggests this is a real problem. The WSM movement particularly among some of the activists in the occupied factory are aware of the need for solidarity with other movements and popular sectors. For example, faced with the threat of factory eviction by the state, they have called on the neighborhood assemblies, and the unemployed movement to join in the defense of their workplace. The growing coordination between the factory occupation workers' movement and the unemployed workers has increased, particularly in moments of crises, and in the face of growing state repression. As Hector (MTD from Guernica) recognized the threat of militarization is imposing the need for the broadest popular unity between factories, assemblies and MTD. Some of the leaders of the unemployed workers' movement not only understand the limits of islands of WSM in a capitalist market, but also project the need for actively participating in the general political struggle at the national level. As Martino of the MTR stated at the FSM meeting, besides resolving immediate problems and recognizing the importance of construction of local power it is important to understand that this local power is linked to the construction of a political force, a national social force. The building of alliances between the unemployed workers' movement and the WSM in the occupied factories is described by a delegate from Zanon in the following synoptic terms. During the initial factory occupation, the organized unemployed workers' joined in defending the ceramics plant from efforts by the former owners to forcibly dislodge the workers, calling on the police. The mass united resistance effectively blocked them. Subsequently, Zanon ceramics a well known and respected product expanded production, and hired ten workers from among the unemployed in the movement. 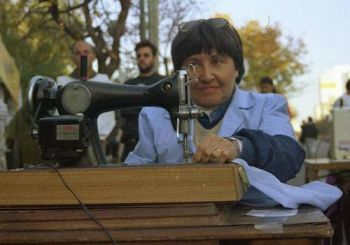 The Argentine WSM movement organized two national events, a march on August 24, 2002 involving over 3,000 workers and delegates from the occupied factories supported by dissident trade union leaders demanding workers' control over all the productive units which are bankrupt, are not meeting their payroll, firing workers, or selling off machinery and equipment. Second, while cooperatives have improved their members' living standards, they have usually found a niche in the capitalist system. At a time when close to 60% of the population is below the poverty line and 4 million children of the 8 million below the poverty line ,are suffering from malnutrition and related illnesses, the political need is to go beyond "islands" of success to basic changes in the socio-economic structure a transformation from savage capitalism to a worker self-managed socialism. The key to the success of the WSM in Argentina depends on deepening the ties to the existing networks, with the neighborhood assemblies, the progressive trade unionists, and the organization of the unorganized. Unity of action is of the highest priority as the crises deepens, factory closings multiply and repression increases. The basic policy of solidarity "tocas uno tocas todos" is a good starting point toward the task of creating a national political movement capable of challenging state power. Strange defeat: The Chilean revolution, 1973- Pointblank!